Gros Michel, often known as Big Mike, is an export cultivar of banana and was, until the 1950s, the main variety grown. The physical properties of the Gros Michel make it an excellent export produce; its thick peel makes it resilient to bruising during transport and the dense bunches that it grows in make it easy to ship. Gros Michel is a triploid cultivar of the wild banana Musa acuminata, belonging to the AAA group. Its official designation is Musa acuminata (AAA Group) 'Gros Michel'. Gros Michel is known as Guineo Gigante, Banano, and Plátano Roatán in Spanish. It is also known as Pisang Ambon in Malaysia and Indonesia, Thihmwe in Burma, Chek Ambuong in Cambodia and Kluai hom thong in Thailand. French naturalist Nicolas Baudin carried a few corms of this banana from Southeast Asia, depositing them at a botanical garden on the Caribbean island of Martinique. In 1835, French botanist Jean François Pouyat carried Baudin's fruit from Martinique to Jamaica. Gros Michel bananas were grown on massive plantations in Honduras, Costa Rica, and elsewhere in Central America. 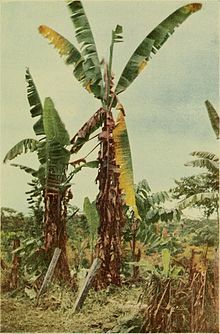 This variety was once the dominant export banana to Europe and North America, grown in Central America, but in the 1950s, Panama disease, a wilt caused by the fungus Fusarium oxysporum f.sp. cubense, wiped out vast tracts of Gros Michel plantations in Central America, though it is still grown on non-infected land throughout the region. The Gros Michel was replaced on Central American plantations and in U.S. grocery stores by the Cavendish. By the 1960s, the exporters of Gros Michel bananas were unable to keep trading such a susceptible cultivar, and started growing resistant cultivars belonging to the Cavendish subgroup (another Musa acuminata AAA). The original Gros Michel variety is a top export for producing countries in Malaysia and Thailand, with the grade A bananas being exported to Japan, and increasingly to China. The Honduras Foundation for Agricultural Research set out to breed Panama Disease resistant Gros Michel bananas, and after initial problems due to poor agronomic characteristics of the plants from which the pollen was taken (male parent), they developed an improved diploid (SH-3142) which served as the male parent for the development of various hybrids (FHIA-01, FHIA-18, FHIA-21 and FHIA-250). The hybrids released so far have good bunch and agronomic characteristics, are resistant or tolerant to Fusarium wilt and are being grown in a wide range of agro-ecological conditions in Africa, Latin America and Australia. "Yes! We Have No Bananas", a novelty song about a grocer from the 1922 Broadway revue Make It Snappy, is said to have been inspired by a shortage of Gros Michel bananas, which began with the infestation of Panama disease early in the 20th century. ^ Robert J. Lancashire (25 August 2006). "Jamaican bananas and plantains". The Department of Chemistry, University of the West Indies. Archived from the original on 22 July 2011. Retrieved 11 January 2011. ^ Koeppel, Dan (2008-06-18). "Yes, We Will Have No Bananas" (Editorial). New York Times. Retrieved 2008-06-18. ^ "The History of Banana Flavoring". Lucky Peach. 2016-05-19. Archived from the original on 2017-06-27. Retrieved 2017-04-11. ^ a b Michel H. Porcher; Prof. Snow Barlow (2002-07-19). "Sorting Musa names". The University of Melbourne. Retrieved 11 January 2011. ^ Dan Koeppel (2008). Banana: the fate of the fruit that changed the world. Hudson Street Press. p. 33. ISBN 1-4295-9325-3. ^ a b "Panama Disease: An Old Nemesis Rears Its Ugly Head Part 1: The Beginnings of the Banana Export Trades". apsnet.org. ^ "Fundación Hondureña de Investigación Agrícola – FHIA – Knowledge and news on bananas from ProMusa". promusa.org. ^ Koeppel, Dan (19 June 2005). "Can This Fruit Be Saved?". Popsci.com. Archived from the original on 21 February 2014. Retrieved 2008-06-22.